If you have just watched Apple’s media event and fancy splurging some money on physical Apple hardware, then allow us to save you some money on that purchase. Right now, Amazon is offering a stunning 17% discount on the 1.6GHz dual-core Intel Core i5 MacBook Air, allowing you to pick it up for just $999.99. The company’s MacBook Air shouldn’t really need any introduction to anyone who has an interest in portable computing. 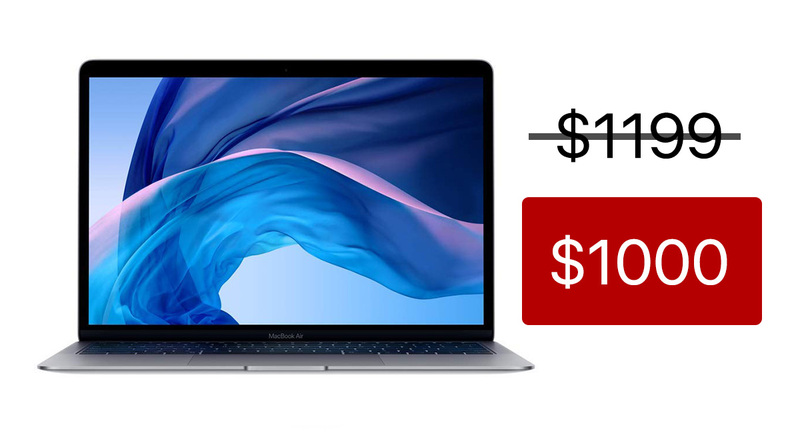 If you currently own a MacBook and need something more portable, or you have decided that you want to seize the opportunity to move from another manufacturer into Apple’s ecosystem, then this is an astronomical deal that allows you to do exactly that. And, of course, it allows you to do it whilst saving money, which is the most important thing. So, what exactly are you going to get? Well, this particular MacBook Air model comes with a 13.3-inch stunning Retina display that makes all of your high-definition content just pop right out at you. It is powered by an 8th-generation Intel Core i5 processor and Intel UHD graphics 617, and 8GB of memory. It also packs in 128GB of storage thanks to the blazing fast internal SSD. From an audio perspective, you’re going to be getting stereo speakers with wider stereo sound and Touch ID built into the machine for more secure authentication and verification at various points of the macOS experience. The machine will also come with macOS pre-installed, which means that you get access to the Mac App Store and all of the apps and games included therein, as well as free-of-charge updates to that system and major updates every twelve months for as long as Apple chooses to support this particular hardware with macOS revamps. You are also going to get your choice of exterior finish at this price point, with Amazon offering the Gold, Silver, and Space Gray options with all discounts included. A great deal that you should really take advantage of right now. Oh, and if you did watch the Apple event, you will be able to get the Apple TV+ experience on this MacBook Air when the streaming service launches later this year.